Note: Games sampled for Percy Harvin included four with Seattle (vs. Packers, Chargers, Broncos, Cowboys) and four with the New York (vs. Chiefs, Bills, Vikings, Titans). It’s been a road littered with potholes for Percy Harvin the football player. From being banned from playing high school sports in Virginia, to failing a drug test at the Scouting Combine, to being jettisoned by two (and soon a third) NFL teams; the immensely talented Harvin has been tripping himself up from reaching his potential for a long time. Outside factors certainly have played a role, including numerous injuries. Now that the New York Jets have Brandon Marshall in the fold, it appears only a matter of time before they part ways with Harvin. Even after the previous regime traded for him mid-season last year, it appears the new brain trust in New York has no desire to work with him. It looks like, for the first time in his professional career, Harvin will get a chance to choose his own team. The question that future employer faces: is Percy Harvin even worth a major investment anymore? It feels like forever ago that Harvin was making game changing plays in Seattle’s Super Bowl victory. His dynamic days as a Viking may as well be a former lifetime. His next team will be working on hope to recapture those moments, because—along with the other issues—his play has slipped the last few years. With that being said, his 2014 was certainly a tale of two seasons. 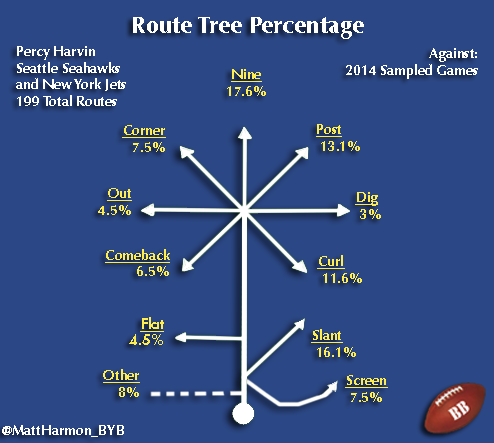 Percy Harvin ran 199 routes in the eight games sampled for his Reception Perception study. The most frequently run was the nine-route, followed by the slant and post. This is important to note, as his trade to the Jets marked a noticeable change in the way Harvin was used. The Seahawks mostly deployed Harvin as a gadget player. Most of his routes were screens, and other underneath patterns. Seattle mostly aligned him in the slot; with over 80% of his snaps coming from that position during the four games sampled that he played with them. Upon his arrival in New York, Harvin was asked to perform more traditional wide receiver duties. His snaps on the outside more than doubled, and the coaches sent him on more vertical routes down the field. The Jets threw him far less screens, and permitted him to play the “flanker” position, rather than using him as a utility weapon. 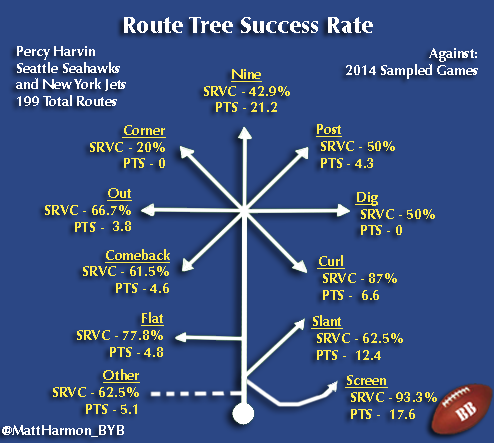 You’ll notice that Harvin’s SRVC scores fall the deeper you go on the route tree. He made the occasional vertical play, with a 42.9% SRVC and 21.2 PTS recorded on nine-routes. However, he was very poor, in terms of getting open, on posts, and particularly corners. A SRVC score of 20% on corner routes is alarming. Harvin did record better scores on a few underneath patterns. He ran a curl on 11.6% of the routes charted for this sample, and posted an 87% SRVC score. His screen (93.9%) and flat route (77.8%) numbers are positive. These are simple patterns, and Harvin is generally adept at separating from coverage on them. What concerns you is some of the poor scores on other short, quick hitting routes. Harvin ran a slant on 16.1% of the 199 routes charted, but posted a SRVC of only 62.5%, which is well below average for this pattern. None of the scores from any other short to intermediate route stand out as overwhelmingly impressive. The hop is one of the more frustrating events to see when watching a receiver. Its an extreme wasted step, and good physical corners can just knock a receiver right off their route, should they chose to. The receiver also makes his route intentions very transparent to the defender. The coverage player will know whether his opponent will run outside or inside, stay shallow or go deep, when the receiver uses the hop. Such technical missteps are inexcusable for an experienced receiver, who has commanded a ton of money and draft capitol, like Harvin. At this point, it’s hard to imagine him ever erasing such bad habits from his game. The hop, and other showings of poor technique will likely always keep this player from being a consistent threat as a true wide receiver. So, what to do with Percy Harvin? He was more productive as a traditional receiver in New York, than as a gadget player in Seattle. Yet, it’s hard to imagine a team relying on him as a flanker, due to his inconsistencies. Harvin’s next team should alternate him between the slot and flanker position, and mostly ask him to work underneath. Seattle learned that his contributions as a gadget player, when considering all the factors, just are not worth it, while the Jets received useful production from him in a more traditional deployment. Of course, the idea of building a passing offense around Percy Harvin should not be a consideration for any team. A receiver who beats man coverage at a 57.1% rate is far too unreliable, and this particular individual is not even a strong bet to be on the field every week. It’s hard to pinpoint many teams that would make proper use of Harvin’s abilities. One fit does stand out, and that’s in Kansas City. The Chiefs are running a limited offense, due to their quarterback’s inability and unwillingness to throw down the field. Harvin is not a threat in the vertical game, nor is he very good at consistently separating on his own down the field. That would not matter as much with Alex Smith at the helm. The Chiefs need receivers who can the ball in their hands on short routes, and create after the catch. Again, Harvin fits. He was “put in space” on 13.6% of the 199 charted routes in this sample, and broke at least one tackle on 48.1% of those plays. Head coach, Andy Reid, is well known for his work with wayward NFL souls, and could help mitigate the usual headaches that come with Harvin in your locker room. The one hang up may be getting offensive assistant Brad Childress to sign off, as he and Harvin had their issues back in Minnesota. The quandary for the Chiefs, or whichever team considers bringing in Percy Harvin next, will be whether what he brings to the table is worth the potential negatives. His Reception Perception data reveals that he is not the high-end player we once regarded him as. The Jets seem to agree, as they were eager to replace him with Brandon Marshall. At this point, adding Harvin to any receiver group has its benefits, but comes with more questions than answers. Are you interested in learning more about Reception Perception, and seeing more players’ data? Be sure to become familiar with the upcoming publication, and follow the #ReceptionPerception hashtag on Twitter to keep up with all future featured receivers (including draft prospects articles at Footballguys.com).